That’s what us golfers want. 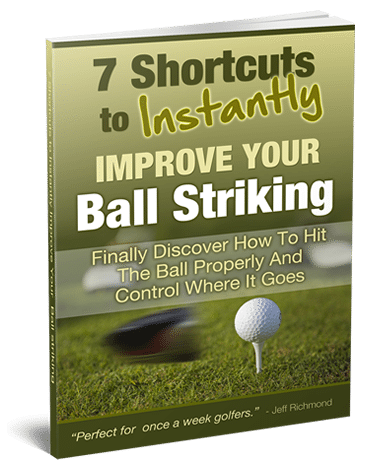 Do you want to hit longer golf drives? Do you have an accurate way to measure if you are hitting your drives further or not? The reason I ask that question is because many, many people want to lose weight. And most have scales to measure and keep track of their weight. Unfortunately scales don’t lie. They tell you exactly what your weight is from day to day. Nobody serious about trying to lose weight would do so without a set of scales. The key to keeping on track with your weight loss goals is to know your progress. How else would you know if you’re actually losing weight?! The same principal needs to be applied to hitting longer drives. The biggest key to hitting longer drives is swing speed. If you don’t know what your average swing speed is for, say, 10 driver swings, then how on earth can you tell if anything you’re doing in an attempt to hit longer drives is really working for you? If you try to measure your distance improvement on a driving range, you have wind and temperature variations that can mislead you. But like scales, a good swing speed measuring device does not lie. 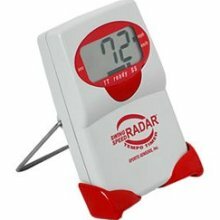 So if you really are serious about hitting the ball longer, you need to get yourself a good swing speed measuring device to keep track of where your swing speed is at. However, having one will not help you hit the ball longer, just the same as scales won’t help you lose weight. What you need is a plan that is proven to help you increase your swing speed, combined with a way to measure your swing speed improvement as you work through the plan. 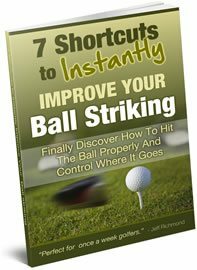 If you’re keen to get started on the road to much longer drives in 2014, then here is the program I recommend to help you swing faster. Plus they have an option to get a great swing speed radar at a very good price after you place your order. So you get everything you need for longer drives in one go. My swing speed at the start of this year was 110.6 mph. And I have set a goal to improve that to over 120 mph by the end of year. The only way that’s going to happen is by working through a systematic plan like this. The same is true with you too. But you’ve got to know where you are now as far as your swing speed is concerned. And then when you REALLY increase your swing speed, you’ll add yards to your drives. It’s about 2.5 yards for every 1 mph swing speed increase. So using my goal as an example, when I’ve added 10 mph to my swing speed, then I will have gained about 25 yards in distance. That’s something to look forward to! Imagine how much easier and more fun golf will be when you do that. From personal experience I know it’s more fun, because I used to average 118 mph – and being 110 mph now costs me shots. But I’m working to get my swing speed back up to what it should be. To start now, go here. But if you just want a swing speed radar to measure your swing speed, here is the one I highly recommend.